Football still has the ability to surprise us all despite the millions of minutes of the beautiful game we have seen. Most expected the encounter with Manchester United on Sunday to be a highly entertaining affair, with energy and passion matched by attacking intent and quality. Bizarrely, the opposite occurred. There were just four shots on target recorded at Old Trafford and only one genuine chance to score which fell United’s way. There was no rhythm, no vitality and no real class, with a strange injury crisis that saw four substitutions made before half-time hardly helping the flow of the game. It means we’ve now drawn three of our last four games, and while that is hardly the cause for hysteria it is clear that a certain je ne sais quo has gone from our play of late. Now would be a good time for the Reds to rediscover their mojo. The loss of attacking buzz has not escaped Jurgen Klopp, and you suspect there could be changes to the starting eleven for Wednesday’s encounter with Watford. “We didn’t create enough and that’s the truth. We didn’t do well to be honest,” he said after the United game. He’s always been an expert at protecting his players during interviews, and the manager once again refrained from discussing the performances of individuals. But Alan Shearer, in a discussion with BBC Sport, hinted at something many of us in the Anfield faithful have been thinking for a while: a lack of creativity in midfield is costing us. “They do not have the ability in midfield to play that quick and incisive pass to produce something out of nothing in a tight game, which is what is costing them at the moment,” the former England international said. Hopefully, those picked in the middle of the park against the Hornets will rediscover the sting in their tail. The ankle injury suffered by Roberto Firmino hardly aided our cause at Old Trafford, with the Brazilian’s link-up play and clever movement crucial in getting us into the final third of the pitch. Reports suggest Bobby could be out for a while – certainly not ready for Wednesday – and so Klopp has something of a conundrum to solve. He may start Daniel Sturridge through the middle in a straight swap, or he might ask Mo Salah to play as an auxiliary striker with Xherdan Shaqiri deployed on the right flank. Unlikely, but possible, is that the manager might change the shape entirely. Andy Robertson has also hurt his arm, which is hopefully the kind of injury that won’t prevent him from starting, although Dejan Lovren is definitely out as he continues to battle his thigh injury. 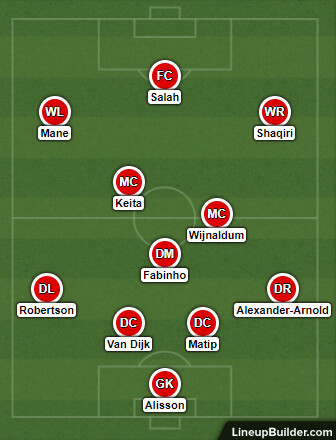 In midfield we will need to be combative to meet Watford head on but also more creative too, so perhaps there is a case to be made for Fabinho and Gini Wijnaldum to be partnered by either Naby Keita or Adam Lallana, with Trent Alexander-Arnold coming in at right back and James Milner and Jordan Henderson given the night off. There is a buzz about the Hornets after they enjoyed their best result of the season last time out: demolishing Cardiff 5-1 with some outstanding attacking play. They’ve now lost just one of their last eight in the league, with three clean sheets kept in their last five outings. You underestimate them at your peril, and a formline on the road of W5 D5 L4 confirms that they are handy on their travels. The Reds will need to be at their best here. Prior to last week’s encounter with Manchester United we mused in this column that the game might not play out as expected, with an emphasis on not losing from their perspective helping them to shut us down. Well, with Watford, we expect the match to unfold as expected. They are a strong, physical side with plenty of pace and power, and the Hornets are the kind of outfit you have to match in terms of doing the dirty work well. But more than that, we need to display our customary but temporarily absent quality in the final third if we are to win this one. We’re a strong favourite with the bookies, as ever, but the absence of Firmino could hit us hard. We expect Liverpool to win this game, but it might be a tighter affair than the odds suggest, so we’ll be backing Watford with a +1.50 Asian Handicap at 27/25. And like last week, the Under 2.5 Goals line looks to be excellent value again, this time at 8/5.